Victorians will be heading to the ballot next month for the state election. Every Australian has the right and responsibility to vote, including people with a disability. Be it federal, state, or local elections, voting is a great opportunity for everyone to have a say about what happens in their community. The VEC works to ensure the voices of people with disability are heard through enrolling and voting at elections. Scope works with the Victorian Electoral Commission to deliver voting information sessions at various Scope services. Their sessions include discussions about what each level of government does and how the voters’ decisions can impact our lives. How much will I get for my pension? Who pays for the hospital that I go to? Who collects the rubbish and cleans the streets in our neighbourhood? Scope is working with the Victorian Electoral Commission (VEC) to deliver these voting information sessions at a number of Scope services. Scope customers have actively participated in voting exercises to support the information and discussion at the sessions. Each session ends with a mock election, ensuring the participants are comfortable using ballot papers. Customers learn about each candidate and what they represent. When asked what advice he would give to people that want to know more about elections and the voting process, Spencer says it’s important to do your homework. Are you ready to vote? Start here. As part of the I Can Vote campaign by Inclusion Melbourne, Scope’s developing Easy English translations for political candidates. This helps people with intellectual disabilities and low English literacy to exercise their right to vote. 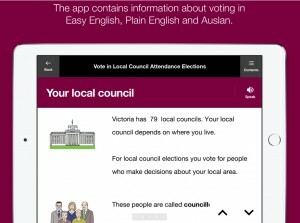 Scope also developed Easy English guides for voting, while providing consultation for VEC’s Voters Voice app. 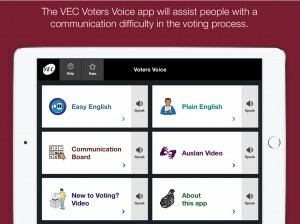 The app provides information about the enrolling and voting process for Victorian voters who have a complex communication difficulty, English language or literacy issues, or those who use Auslan. Scope’s mission is to enable the people we support to live as empowered and equal citizen. To achieve equality and true citizenship for people with disability, the electoral process must include them.